Subscription boxes, let's talk. Up until recently, I wasn't tempted by any subscription boxes. I think Birchbox and Ipsy are probably the biggest players in the beauty game, and most "unboxings" I've seen haven't really appealed to me. But when mah gurl Mayette got her Petit Vour box shipped to our office, and I saw what was inside and immediately thought "Okay welp I'm getting in on this." "Beauty is bold. Beauty is kind. Beauty is self-expression and emotion, inner glow then outer glow. We strive to enhance these elements for you and help make it easier in maintaining a compassionate lifestyle. Every aspect of our beauty box is thought out and constructed to provide you with the highest standards. To us, that means no animal testing, animal products, parabens, phthalates, formaldehyde, sulfates, and so much more." If I'm being honest, I'm not a huge perfume sample lover. I just never end up wearing it because I use bottles I already own, and perfume is something I only set out to explore every once in a while. With that lackluster introduction, I should clarify that I actually like this! The scent I got was nectar, which is described as "succulent florals, citrus and honey." To me, that sounds sweet and floral, which are two things I rarely go for. Instead, I would describe it as a feminine version of a man's cologne. Which, as a cologne lover, I prefer. This is my first Pacifica product, but I've eyed the brand many a time at Target and Sprouts! The Devocean lipsticks (Like devotion, get it? ...Because I didn't.) come in 5 colors, smell like coconut, and claim to have high pigment that won't feather. Personally I think it worked more like a very tinted balm that was buildable, rather than a lipstick that was opaque on first swipe. I got the color Rebel Sol, which reads on me like a coral-y red orange. I personally don't find the color very flattering on me by itself, so I'll have to pair it with a gloss or wear it more sheer. FLO+THEO's body butter has the meltiest texture. When I scooped some of this in my hands and rubbed them together, I instantly was reminded of coconut oil. Which, as is turns out, is the 3rd ingredient (out of 5 total). And unlike the other body butters I own, this sinks into my skin, so that I can actually put on a pair of jeans after without feeling greasy and gross. I got the Wild Mint scent, which smells exactly like you would imagine. But I would also love to try the Lemon Harvest or Orange Orchard scents. 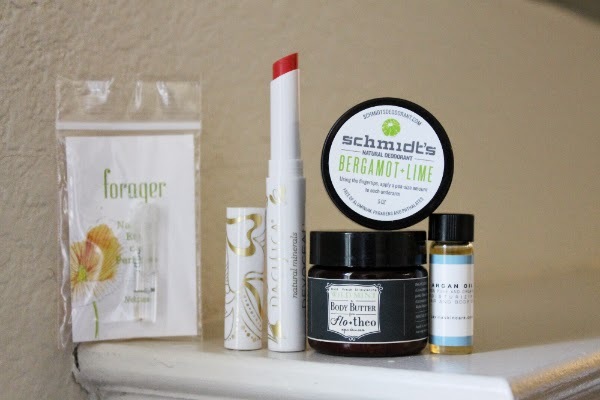 I've heard green and non-green beauty bloggers alike talking about Schmidt's deodorant for the last couple of months, so I was really excited to get to sample it with my first box. Let me just start off by saying that I love the scent. Bergamot lime smells so soft and fresh and maybevaguelylikeamargarita. The application instructions say to take a pea sized amount and run it under each arm. So yes, you're gonna have to use your hands with this, but I really don't have an issue with that. Chances are you're fresh out of the shower when you apply. And if you're not, just wash your hands after. The texture on mine was a little stiff, so I dug mine out by scraping with the back of a fingernail. I thought this melded into the skin so well! Every brand who's any brand seems to have their own argan oil. This is not a criticism, I love argan oil! It was the first oil I really dared to put on my face and I attribute my love of other oils to that fact that it treated me so well right from the start. Personally I've been buying bottles of Josie Maran's Argan Oil Light, since I primarily use it on my face, which is combination/oily. But I'm taking this opportunity to use the Lavina argan oil I got (in the most adorable bottle ever) as a hair/body treatment. While my hair is damp, I take about 4 drops worth in my palm, and apply it mostly from the middle of the strands to the ends. Now, I have very fine hair, but I haven't had any issues with greasiness, which is my concern with any hair product. I just recently got a haircut which snipped all of my dry, dead ends, but I'm intrigued to see if this will help extend the life of my hair. CONCLUSION: I. Love. This. And I definitely feel like you are getting the value for your money. All of these are good quality and sizes, and the worst thing I can say is that I don't think the lipstick shade looks the best on me. Not too shabby. In addition to the monthly box, you can also purchase full sizes of all the products they sample out in their shop. And like other subscription boxes, you can rate the products you're sent to earn points for said shop. And after I signed up and had already begun writing this huge post, they're ambassador program emailed me a referral link to their sign up page. So hey, if you're interested, you can sign up here! Disclaimer, blah blah: I purchased this box all by myself, with my own hard earned cash. 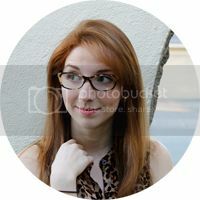 I received the affiliate link by pleasant surprise!